Last week, patients of the Paynesville Area Hospital got their first glimpse at a new computer system of the Paynesville Area Health Care System (PAHCS). A new system-wide computer now allows PAHCS to send one bill to each patient, where previously patients would have gotten one bill for the hospital and one bill from the clinic for physician's services. Currently, PAHCS has medical records for the clinics and the hospital stored separately. A key part of the new system is having one number to identify each patient. In the past, PAHCS Ð which has both an in-patient hospital in Paynesville and six clinics in town and the surrounding communities Ð has not had a unified computer system. So, patients were billed for both hospital and clinic services, leading to cases of double sticker shock. Patients complaining about double billing was the most frequent complaint brought to PAHCS, said Bev Mueller, patient care administrator. "It was very confusing for patients,"Êshe explained, "because they paid one bill and then they got another." Letters explaining the change will be included along with the single billing statement. This situation is being remedied by a half-million-dollar project. The new software for the clinic - from the same software company as the hospital program - was installed in the last couple months. Over one weekend in June, clinic staff switched the clinic schedules to the new computer system. Over another weekend, 8,000 clinic balances were manually entered into the new computer system. A main feature of the new system is that every PAHCS patient will get a patient number. Before, only people who were admitted to the hospital got a patient number. This number now will be used to refer to the patient in both clinic and hospital medical records, allowing the single billing. This desirable change is only the start of the project. This fall, the health information department will be moving to computerized transcriptions of medical records. 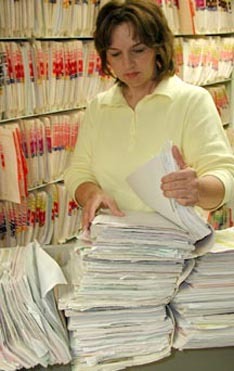 Having a single patient number is also needed for all the records to be located in the same file. The benefit for the health information staff will be that they can just type in a name, and all the patient's information and history should come up, meaning less typing and fewer typos, said Rose Welle, head of the health information department. Only new records will be entered on computer. Existing paper records will continue to be stored. Having the medical records on computer will provide better access throughout the system. The clinics will be linked to the main campus through a wireless frame, allowing faster access to records. Right now, Welle's staff spends time every day faxing medical records to the satellite clinics. They also spend time pulling charts for clinic visits and filing charts. And lag time between a patient visit and when the record of that visit is filed will be reduced. This should improve communication within the system, which won a state award a year ago for its team care. The paper files, at best, are tedious to access, added Welle. PAHCS also has patients who are seen at different satellite clinics, making it difficult to maintain a paper trail. While clinic visits should be faster due to quicker access to records, Mueller said the improvement in continuity of care will be the greatest advantage of the new computer system. "Right now we're faxing everything (to the satellites) or if they're closed we don't get it," Mueller said. One current problem for PAHCS is finding out what medication a patient is taking or what sort of allergies to medicine he or she has. Patients should bring any prescriptions they are taking to an appointment so the clinic staff can avoid any drug interactions. Too often, patients don't know what medication they are on, and even try to describe the medicine by the size of the pill or shape of the bottle, which is not enough to determine the type of medication, Mueller said. Eventually, the new computer system should allow the physicians to transcribe the patient records directly to computer. The local physicians Ð who started this process with their exposure to computerized medical records at other hospitals Ð are researching which transcription program PAHCS should get. Possibly within the next year, the physicians will be able to carry a laptop computer into the examination rooms, access a patient's history, and input the results of the current examination. Most of the medical records may be finished when the doctor leaves the examination room, explained Karen Bachman, PAHCS's Chief Financial Officer and computer guru. "Patient care should improve because everything will be at their fingertips," said Mueller. "It'll save so much paper time," she added. Security will also be improved with computer records. Staff will have passwords that limit their access. Plus, audits could be done to check who had accessed what records. The upgrade consists of software and some hardware purchases. Right now, Bachman estimates PAHCS has 75 computers throughout the system, but that number could double as medical records get computerized, she predicted. PAHCS has received a $264,000 United States Department of Agriculture Rural Development grant to help cover the cost of the project. The grant was written with the help of the University of Minnesota's Rural Health School, which contributed $900 to the grant writer. PAHCS spent $400 for the grant writer.